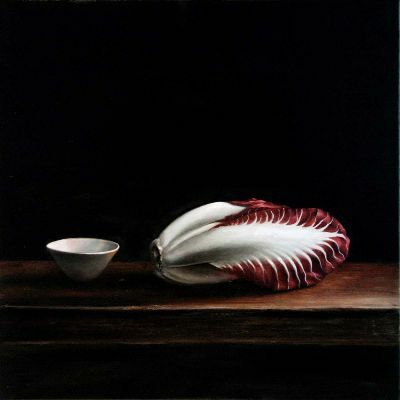 Radicchio di Treviso with a Bowl, Jo Young, 2011. Thanksgiving dinner is okay, but truthfully it’s never been my favorite collection of flavors. In my opinion it always needs a few anchovies. I’m just now finding the pleasurably bitter, wine-red-colored radicchio called rosso di Treviso in my markets. It’s really a beautiful thing, like a cross between a Belgian endive (which it’s related to) and a red tulip. I specifically mean the Treviso variety named Precoce, I believe because it’s the first to be harvested. There’s also a type called Tardivo that resembles a dark red and white cluster of long, skinny fingers. It’s a knockout, but unfortunately I can’t find it very often. Still, I’m happy with the compact Precoce. It’s excellent either grilled or roasted. For Thanksgiving, roasting is my choice. Radicchio can handle heavy seasoning, and even the addition of anchovies won’t mask all that wonderful Italian bitterness. The salty little fish meld with it, producing a taste that’s truly greater than the sum of its parts—as often happens when you combine profound flavors. You so need a dish like this to cut through all the stuffing, turkey, gravy, and mess of gentle, somewhat sweet, soft vegetables that always show up on the Thanksgiving table. I see it as an Italian version of cranberry sauce, serving the same jolting purpose but in a more elegant way. Choose a shallow baking dish that will fit all the cut radicchio in one layer. Coat it with a little olive oil. Lay the radicchio in the dish, cut side up. Pour the vermouth over the radicchio. In a small saucepan, heat about 2 tablespoons of olive oil with the butter, the garlic clove, and the anchovies, just until melted. Press down on the garlic a bit to release its flavor, and then discard it. Pour the butter mixture over the radicchio. Bake, uncovered, until the radicchio is wilted and tender when poked with a knife, about 12 to 15 minutes . Mix the breadcrumbs with the cheese, a drizzle of olive oil, and the thyme. Season with a pinch of salt (remember, you’ve already added anchovies) and more liberally with black pepper. Sprinkle this over the top. Run the radicchio under a broiler, just until the crumbs are lightly golden and crisp, about a minute or so. Serve hot or warm. Joan, Yes you can probably find the radicchio at Whole Foods. The recipe also works really well with Belgian endive. Oh, Erica, I must make this! My mother used to make a very similar dish using halved baby artichokes. The entire artichoke is edible when small. They were so good. I’ll try to find the red rad, I know it will be e excellent. Zingara, I’ll be this is great with the baby artichokes. I’m gonna try that. It’s also great with Belgian endive. Zingara, How many times can I write great?